Editor’s note: This is the third in a series of posts considering the intersection between environmental history and labour and working-class histories. The entire series is available here. Harold Innis wasn’t wrong. As much as the Staples Thesis can be problematic, natural resources are central to Canada’s foundation and future. Canadians have historically worked with the natural environment to supply both national and international markets. In the process, workers and their families formed communities rich with tradition. According to Natural Resources Canada, 1.8 million Canadians worked in the natural resource industry in 2014. Forestry alone made up over 20% of the income in 171 Canadian cities. Indeed, if the whole world imploded around Canada, we would still have fuel in our cars, water in our cups, fish on our tables, warm houses to shelter us, and diamonds on our rings. 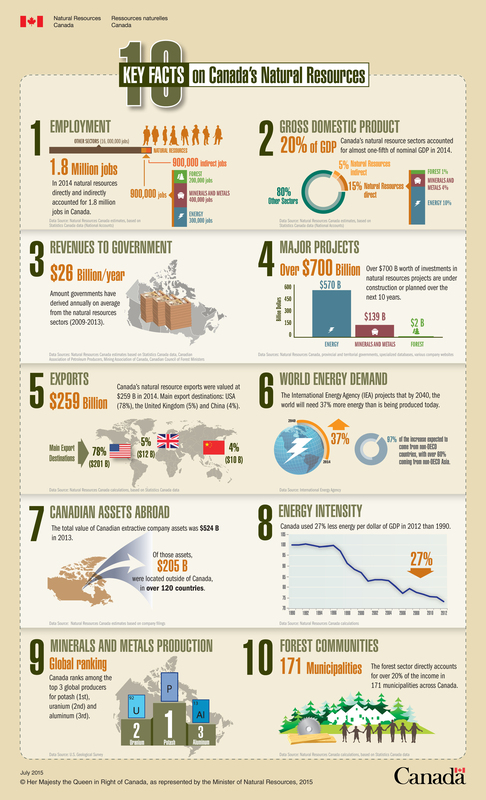 10 Key Facts on Canada’s Natural Resources. Source: Natural Resources Canada. As remarkable as the domestic impact of these activities has been, Innis reminds us that Canada’s natural resource industries are part of a global phenomenon: the country does not, in fact, exist in a bubble. A full 20% of the country’s GDP in 2014 came from natural resources. Valued at $259 billion, these accounted for more than half of Canada’s exports that year. In fact, Canada has never really been a country that controls the ebbs and flows of its natural resource industries. Its valuable and valued natural resources have largely lain in the hands of multinational corporations, whether of British imperial or American origin. This is, of course, how big business works, and natural resources are certainly big business. To resource communities across Canada, however, their land and labour is not simply business: it’s a way of life that forms a fundamental part of cultural identity. Resource workers quickly learn the inherent vulnerability of this lifestyle. Operations close down during economic depressions; local populations boom during market highs. Community life shifts constantly in response to the whims of international markets. The local-global orientation of Canada’s resource communities can bring great success, but also great sorrow, as I have found in studying the town of Asbestos, Quebec. The history of this mining community began with a local discovery and a local company. Just as the asbestos industry was about to boom during the First World War, the mine was purchased by the American Johns-Manville Company (JM), the largest manufacturer of asbestos-based construction products in the early 20th century. The Jeffrey Mine, Asbestos, Quebec. Asbestos’ mining landscape was unique. Since the mineral deposit was laid out in a tight circle, rather than a linear path, only one giant mine was required to extract the raw ore. 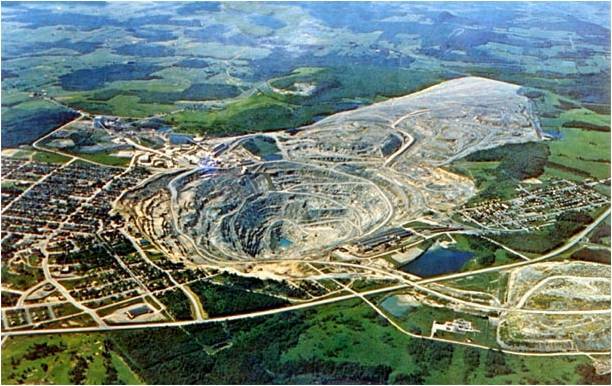 The Jeffrey Mine in Asbestos quickly became the largest asbestos mine in the world. It was a true jewel in JM’s crown, feeding its American manufacturing plants with the raw fibre that was once considered “white gold.” The mid-20th century was an exciting time for the people of Asbestos, and for those investing in Canada’s asbestos industry. As many historians of natural resource communities can attest, however, there is a fine line between workers extracting a commodity and workers becoming commodities. Between 1944 and 1958, JM secretly removed the lungs of dead Canadian asbestos workers, and drove them across the US border for study at the Saranac Lake Laboratory, near Lake Placid, New York. During this period, Quebec extracted over 50% of the world’s raw asbestos, valued at $82,028,700 in 1958. It was an incredibly lucrative business, and it seemed as though the world couldn’t get enough of this magical, fireproof mineral. However, since 1909, medical researchers had been reporting deaths arising from asbestos-related disease. The corporations investing in Canada’s asbestos wanted to know what exactly the mineral did to the human body, but without its workers—or the general public—finding out. Thus a secret agreement was struck between researchers at the Saranac Lake Laboratory and Johns-Manville. 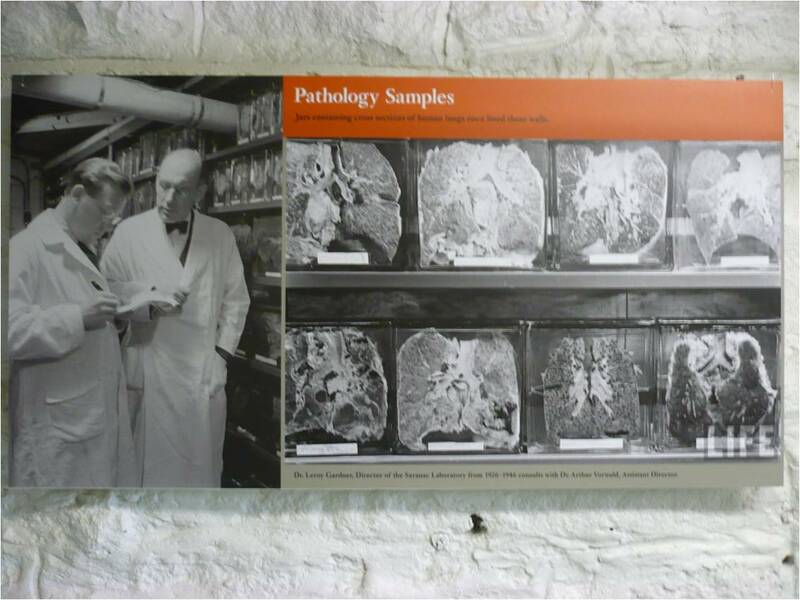 The research facility had initially been a non-profit retreat and lab, where Norman Bethune, among others, went when suffering from tuberculosis. With the onset of the Great Depression, resources dried up and the lab’s funding policy changed. The asbestos industry became a major donor to the lab on the condition that the research they funded had to be vetted by company officials prior to publication. Dr. Leroy Gardiner, Director of the Saranac Lake Laboratory from 1926-1946, with Dr. Arthur Vorwald, Assistant Director, and with samples of workers’ lungs to their right. Photo: Jessica van Horssen. So why steal lungs? Well, partly because the company saw workers as dollar signs rather than humans, and partly because it was easy. This was a time before government-run health care. The Premier of Quebec, Maurice Duplessis, was pro-international business. He allowed corporations a number of concessions, including the removal of asbestos-related disease from the province’s workers’ compensation legislation. Just like the raw asbestos spread out underneath the town, international asbestos companies treated the bodies of the people of Asbestos as a resource to be extracted. They ordered the doctors at the JM hospital in Asbestos and at nearby Thetford Mines, to secretly remove the lungs of deceased asbestos workers. Their lawyer, Yvan Sabourin, drove these organs across the border in the trunk of his car. Workers in Canada’s asbestos mining communities were unaware that their lungs could be autopsied after they died, and their families were not informed if and when this happened. Indeed, JM claimed its doctors did not perform autopsies at all, and that, therefore, the cause of workers’ deaths could rarely be determined. This resulted in failed workers’ compensation claims and a confused local understanding of the dangers asbestos posed to human health. 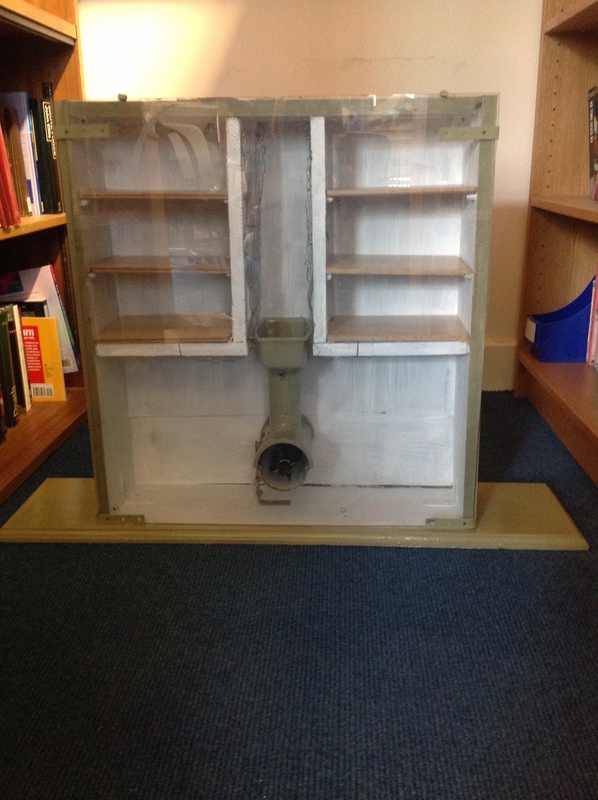 A model of the dusting chamber at Saranac Lake Laboratory, built by Jessica van Horssen. Dr. Leroy Gardiner headed Saranac Lake Laboratory in the early 1940s. During a recent trip to the lab I read through his research diary. It included plans for the construction of a dusting chamber, in which laboratory animals would experience the same day-to-day levels of contamination as workers at the Jeffrey Mine. As the plans were right in front of me, I decided to construct a scale replica of this dusting chamber. Doing so was a fascinating process that allowed me to access—just a little bit—how Saranac’s researchers viewed the people and community of Asbestos. They were simply lab animals in a cage, unable to leave or to do anything about their exposure to the deadly mineral. By 1958, Saranac Lake researchers had discovered over 70 unreported cases of lung cancer in the lungs of dead Canadian miners. None of the families of these workers were informed of these discoveries. Neither were asbestos workers nor the general public. Instead, this information, along with the rest of the research, stayed private. Families were told that smoking cigarettes—a stereotype associated with the working class—had been the cause of their loved ones’ deaths. When I first encountered this history of secret autopsies and stolen lungs, I felt a bit like Erin Brockovich… if, of course, Erin Brockovich had waited a generation to warn people about the dangers of their water. The time delay between an important event and a historian’s first examination of that event is both necessary and problematic. While researching the town of Asbestos, I had access to an incredible number of private files detailing the corporate deceit that companies like JM inflicted on workers and the general public. Yet I have not been able to find any names attached to these stolen lungs: once company doctors took them from the body, they lost all attachment to that person, that place. I’ve made efforts to inform the community of these events, and have given the local historical society all of my primary research. But in lieu of exhuming the bodies of every Jeffrey Mine worker who died between 1944 and 1958, we will never know just who was autopsied or how he died. So how then, do we begin a process of understanding and reconciliation? Perhaps by constantly inquiring about the rights of resource workers, and working to understand the nature of their vulnerability, as well as the vulnerability of their industries. Asbestos was only one of Canada’s natural resource industries. Since 2012, it is no longer mined in the country. However, that still leaves 1.8 million Canadians actively working in resource industries today, interacting with the natural environment in both positive and negative ways. Furthermore, international corporations continue to dominate the ownership of Canada’s resource industries, benefiting from local labour without firm investments in the people who rely on these jobs to survive. We need to work as a society to avoid taking advantage of these workers; we must go beyond labelling them simply lumberjacks, fishermen, or “men of the deeps.” They are the organic machines that drive Canada’s economy, both past and present. The risks of their fields should not just be dismissed because of class, occupation, or romance. Marc Vallières, “Annexe statistique et sources des figures,” in Des mines et des homes Histoire de l’industrie minérale québécoise des origines à aujourd’hui. Government of Quebec, 2012, http://www.mern.gouv.qc.ca/mines/desminesetdeshommes/index.jsp#annexe. Gerrit W.H. Schepers, “Chronology of Asbestos Cancer Discoveries: Experimental Studies of the Saranac Laboratory,” American Journal of Industrial Medicine, vol. 27 (1995), pp. 602-603. Jessica, this article is beautifully and sensitively written, at the same time as its content is horrifying, and so terribly, terribly sad. Thank you for doing the work you do. It is so important for us to know what is done to some people by other people, behind the scenes. It reminds us as well that we need to do as much as possible to uncover the myriad hidden crimes currently being carried out against workers, in Canada and elsewhere.